We remember the brilliant and evocative music Bob Marley gave the world; music that stretches back over nearly two decades and still remains timeless and universal. Marley has been called “the first Third World superstar,” “Rasta Prophet,” “visionary,” and” “revolutionary artist.” These accolades were not mere hyperbole. Marley was one of the most charismatic and challenging performers of our time. See more: The King of Reggae music and still to this day the most influential musician to come out of Jamaica is the legend, Bob Marley and a trip to Kingston is not complete without a visit to Bob Marley Museum. 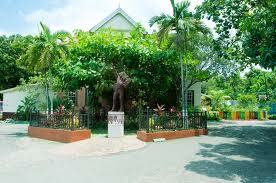 The museum is located on the site of the legendary musician’s home, which he purchased in 1975. This house, featuring 19th-century architecture, was Marley’s home until his death in 1981. 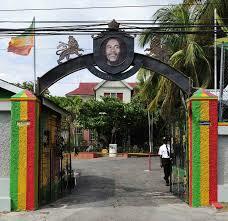 It was converted into a museum six years later by his wife, Mrs Rita Marley. The main museum displays the life and achievements of this phenomenal musician through artifacts, memorabilia, numerous writings, photographs and other head-turning mementos. The property also features a well-equipped 80-seat theatre, a photographic gallery, and a gift shop selling T-shirts, posters and CDs and other Bob Marley memorabilia as well as items from Jamaica. You can also tickle your palate with sumptuous meals from the Legend Cafe. The venue allows you to see every aspect of the life of the legend. Brilliant red, green and yellow colours decorate the exterior of the creaky wooden house on 56 Hope Road where the museum is located. In addition to being Marley’s personal residence, this place was also the site of Ziggy’s Record Manufacturing, and Tuff Gong Record Shop and Recording Studio. Today, the factory has been converted into an exhibition hall with rare photos of Marley and his family. 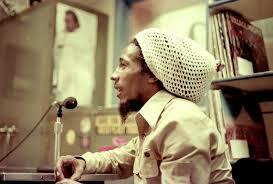 The exhibit also displays some of Marley’s cherished possessions, such as his favorite guitar and mixing console. Take a guided tour of the Marley complex. Inside the house, you’ll see some of Marley’s personal effects and treasured mementos. In the award room, browse through an impressive collection of Marley’s prestigious awards, including the Grammy Lifetime Achievement Award, given to his family in 2001. Around the house, you’ll discover a collection of small shops and boutiques, tucked away in cozy, tree-shaded corners. Make sure to check out the gift shop, which is Jamaica’s sole supplier of the trendy “CATCH A FIRE” clothing line, designed by Marley’s eldest child Cedella.